​The Law Office of Diane F. Russell is a full service law firm that strives to provide its clients with the highest quality of legal representation. In living this philosophy, I realize and respect that I must be an understanding and empathetic advocate for my clients. I also believe that it is critical to maintain the highest ethics and integrity when counseling and advocating for my clients. I know that many of my clients visit an attorney's office in less than ideal situations. My philosophy is grounded in the belief that I should achieve results for my clients that are not necessarily 100% "legalistic," but that also look at the real world consequences of those actions; for example, it may involve learning how to deal with a high-conflict co-parent or employee. This philosophy allows me to achieve a result for my clients that is substantially better than my client would have received without my services. We are fortunate to live here; I am strongly committed to ensuring that Kitsap County and the Olympic Peninsula have a good quality of life. To achieve this philosophy, I serve our community through charitable giving, pro bono legal work and involvement in community groups. 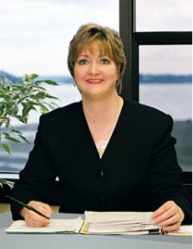 Diane F. Russell has provided pro bono legal services to: Bremerton Symphony Association, Silverdale Chamber of Commerce, Kitsap Sexual Assault Center, Greater Peninsula Conservancy and YWCA as well as for individuals. Diane has also provided low bono legal services (legal services at a substantially reduced rate) to the Kitsap Humane Society, Habitat for Humanity, and other non-profit agencies. At this time, Diane is providing substantial pro bono services to non-profit agencies and is not able to provide pro bono services to individuals. The Law Office of Diane F. Russell has provided financial support to organizations such as YMCA, YWCA, Project Family, Central Kitsap and North Kitsap School Districts, Kitsap Regional Dispute Resolution Center, the Kitsap Volunteer Attorney Services Program, Susan G. Komen Race for the Cure, American Red Cross, Kitsap Humane Society, St. Vincent DePaul, Kitsap Community Resources, Kitsap Mental Health Foundation and The Sun Bell Ringer, to mention a few. The Law Office of Diane F. Russell has contributed time and resources through board membership and volunteer services to many deserving organizations to help better our community's quality of life. Some of those organizations include the Kitsap County Bar Association, Silverdale Chamber of Commerce and the Kitsap Chapter of Washington Women Lawyers. She organized and served on the faculty of the People's Law School for many years when it was offered in Kitsap County.